On August 10, 2017 I heard about the demise of Dr Ruth Pfau. Within hours, social media was filled with condolence messages and appreciation posts for Dr Pfau’s efforts to counter leprosy in Pakistan. Prayers for Dr Ruth Pfua. "We shall remember you as Ambassador of humanity and for selfless services to the people of Pakistan. RIP", COAS. Saddened to learn of Dr Ruth Pfau's passing. Her spirit of selfless dedication leaves a void that will be difficult to fill. 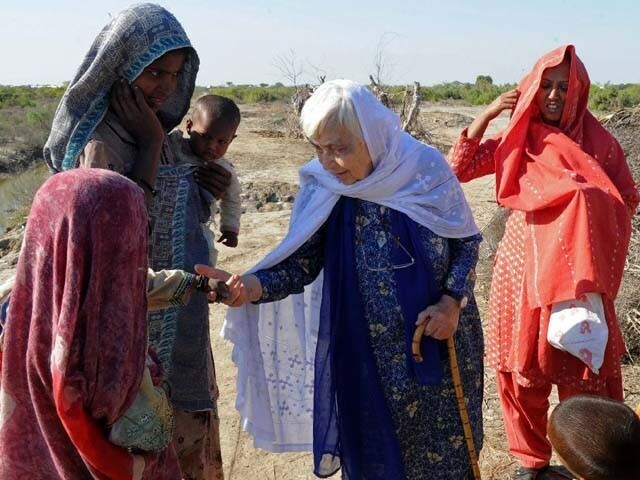 Dr. Ruth Pfau who recently passed away dedicated her life to fighting leprosy in Pakistan. She was a recipient of the prestigious Hilal-e-Imtiaz and Hilal-e-Pakistan awards. Since I was born in the 90s, I had to do some research into Dr Pfau’s history. I didn’t know much about why she was so highly esteemed and what she had done for Pakistan. I was baffled to find out her accomplishments, and I realised how odd it was that in my 21 years of existence, I did not even hear of her once. It was inspiring to see how a woman who wasn’t even a native did so much for Pakistan. She left her country and her family and came to Pakistan to treat patients suffering from leprosy, the very patients who were disowned and left to die by their own families. She came here and became a symbol of hope for patients who were ostracised by society. How was I supposed to know about Dr Pfau, who she was or what she had done for my country? I was never taught about her, whether it was in school or even at home. The woman who called Pakistan her own country was not even considered worthy enough to be mentioned in the curriculum of the country. The least they could do is add a chapter about her humanitarian work in course books. How abhorrent is it that it was her death that made me pay heed to this selfless lady? I should have been taught about this woman who, despite an on-going war, denied leaving Pakistan even when she was asked to do so. She not only stayed in this country but served its people till her last breath in spite of having a life in her own country. When I was looking for role models, I should’ve known about her. This entire episode made me realise how scarcely we’re taught about the endeavours of non-Muslims who have done wonders for our country. And how seldom they’re mentioned in the media, probably because negative sells more than positive does. When it comes to hate, we are vociferous, but what about love? Our textbooks are loaded with the heroics of Muhammad Bin Qasim and the philanthropy of Hatim Tai or the conquest of Somnath by Mehmood Ghaznavi but not a verse about Dr Pfau or Ardeshir Cowasjee. The public’s general knowledge about these non-Muslim prodigies is abysmal. How many of us know the man after whom Nadirshaw Eduljee Dinshaw (NED) University is named? Who is aware of Narayan Jagannath after whom the Narayan Jagannath High School (NJV) is named? No one knows the answers to the questions above, except for maybe a few older people from the same generation as those pioneers. I want to learn about the heroics and valour of Group Captain Cecil Chaudhry along with Muhammad Mahmood Alam. I want to read a chapter on the daring acts of Squadron Leader William Desmond Harney and Wing Commander Mervyn Middlecoat in the same books as Rashid Minhas. The tales of the 1965 war should also encompass the bravery of non-Muslim soldiers instead of just the Muslim ones. My social studies teacher should tell me that the first law minister of Pakistan was a Hindu. Abdul Sattar Edhi is the face of humanity in Pakistan but the acts of compassion by Sister Gertrude or Dr Pfau are no less, if not equivalent. They need to be acknowledged too. Biopics and documentaries can be made on Malala Yousufzai, Qandeel Baloch and acid attack victims, but these selfless people who dedicated their lives taking care of our people and got nothing in return, are not worthy of it? Justice Dorab Patel, Justice Alvin Robert Cornelius and Justice Rana Bhagwandas are revered names in the judicial history of Pakistan. Are we not taught about them only because they’re non-Muslims? Why do I have no idea who Deena Mistri or Julius Salik is? It is because no one told me about them. People who design the curriculum think it’s okay for children to read about Mirza Ghalib’s love letters or Mir Dard mourning the betrayal of his lover but not the services rendered by these minority heroes, which I find bizarre. These acts should be highlighted vehemently, especially in a country whose image is associated with the suppression of minorities. We need to tell the world that we do respect the services of our minorities and we love them as much as they love this country. There is no shying away from the fact that our curriculum has been subjected to religious segregation and bigotry. Purposely, the sacrifices of non-Muslims have been omitted to satisfy the appetite of our leaders and to thrive the agenda of those who want to inflict extremism. We should make it a point to include them in our textbooks and portray them with pride in the media. This will be a great counter-narrative for those who want to segregate the greens and whites of this nation. To embrace our non-Muslim brother and sisters, we must take pride in their services to this homeland. The state funeral for Dr Pfau is surely the beginning of this revolution we desperately need.